MOSCOW, January 28. /TASS/. 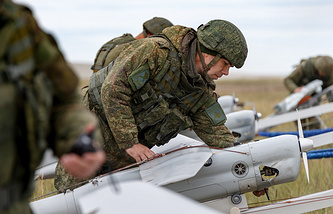 Russia has test-fired weapons from a small interceptor/attack drone, a source in the defense industry told TASS on Monday. "During the continued flight trials of the Karnivora drone, the use of the ammunition load was tested: the attack weapons and nets for the interception of other drones," the source said. As TASS reported earlier, in its attack configuration, the Karnivora will be capable of using, in particular, various high-explosive fragmentation grenades and small-caliber anti-tank air bombs. As the source added, "after the factory trials are over, there are plans to test the operation of the Karnivora strike drone in combat conditions. The source declined to give the details of the drone’s tests in a combat environment. TASS has no official confirmation of this information yet. The Karnivora small strike drone (from the Latin Carnivora) has been developed by Micran research and production company. The drone is designed to intercept other unmanned aerial vehicles (UAVs) using net guns (the net captures a hostile drone and lands it with a parachute), conduct reconnaissance and also strike ground targets. It can take off from rough sites and hover for 10-15 hours. 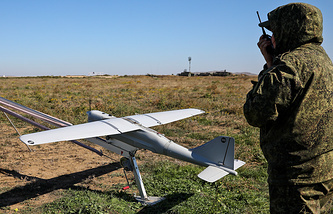 The attack drone is capable of operating under electronic counter-measures amid the full loss of satellite navigation signals. The UAV has a large cargo hold (35 liters) and a sliding wing for balance control. The Karnivora is also capable of performing missions in an autonomous mode.